U.S.A Made quality system complete with tap and fittings for easy installation. 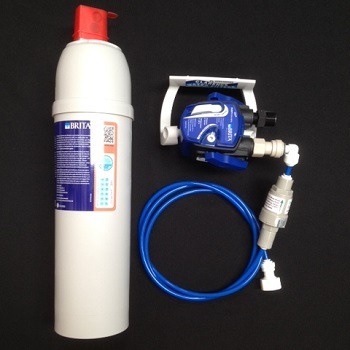 Tank water system without a pressure limiting valve for use on tank and water pump applications. 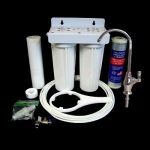 Convenient great tasting water on tap in your own kitchen and you will never have to boil your drinking water again with this system. Reduces Dirt, Mud, Slime, Algae, Fibers, Toxins, Solvents, Pesticides, Herbicides, Chloroform, Chemicals. Giardia, Cryptosporidium and many more contaminants. 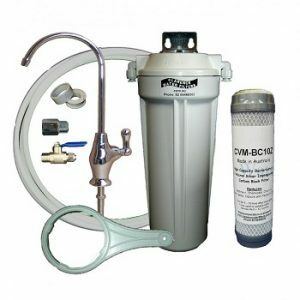 The system uses the CWF-CVM-BC10Z Silver impregnated Bacteriostatic Carbon Block filter which is tested and passed to remove live Giardia and Cryptosporidium to give you 99.96% bug free drinking water. 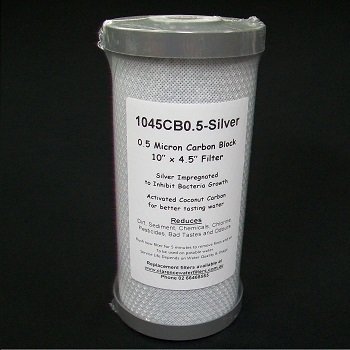 Silver impregnation inhibits the re-growth of bacteria in the filter. Complete with easy to read installation instructions and all fittings needed to install. Single QMP housings on a Steel mounting bracket with quick connect push in tube fittings. 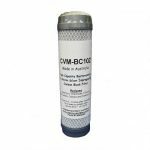 Silver impregnated CWF-CVM-BC10Z cartridge. 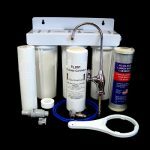 Installation kit contains cold water supply 1/2″ connection to braided lines. Shut off tap for servicing. 3 meters of 1/4″ high pressure tubing which will allow you to mount the system away from the sink cupboard. System can be standing up or on it’s side if height is a problem. Thread tape and housing spanner are also supplied. Simply contact us if you require different size fittings or if you have 1/2″ copper pipe. In the tap options you can choose between the Standard filter taps that only need a 12mm hole through the sink or bench top or use a all in one 3 way tap that can replace your existing hot and cold mixer tap. Simply click on the taps option to view all the available taps. 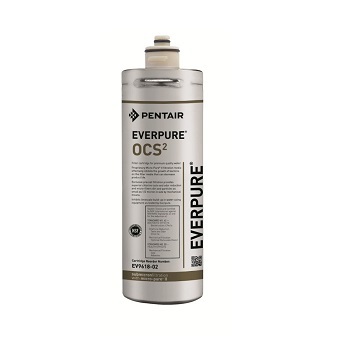 It’s recommended to replace filters every 2000 litres or 6 to 12 months depending on your water quality.